The following links will take you to the various transfer equivalency tables that are provided by the following four-year colleges and universities in Alabama. 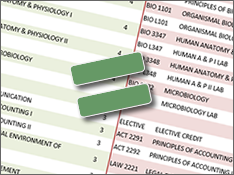 These tables tell students how specific courses will transfer into their respective institution. If you know of a link that we do not have below , please email the link to us and we will add it to our page. NOTE: When you click the links below you will be taken to web sites maintained by the various universities. The AGSC/STARS office does not guarantee the accuracy of the information found on these pages. If you know of a link that we do not have, please email the link to us and we will add it to our page.